During this year we have posted over 400 updates. We have been working together with other judges in charge of projects (such as Judge Anniversaries, Judge of the Week, the Judge Articles blog, or Magic Judge Monthly, just to name a few) to periodically schedule posts advertising those projects, giving them a larger reach. We have a shared Google doc where we program a schedule, and anyone who needs/wants stuff to be posted periodically on Facebook is granted access to it. Additionally we monitor other communication channels to make sure the community would punctually get information about everything going on in the judging world. Rick Salamin has been taking care of uploading the profile pictures taken at GPs to be used on Judge Center and JudgeApps to this album on the Facebook page. Check it out! Is your pic there? Rick also has been coordinating the publishing of staff pictures taken at GPs all around the world, massive kudos to Rick for his ongoing efforts. As 1st of January 2015 the page had 4900 “likes”; and now we are at 6365! Of the users we reach 20% are female, 55% of them are between 25 and 34 years old. 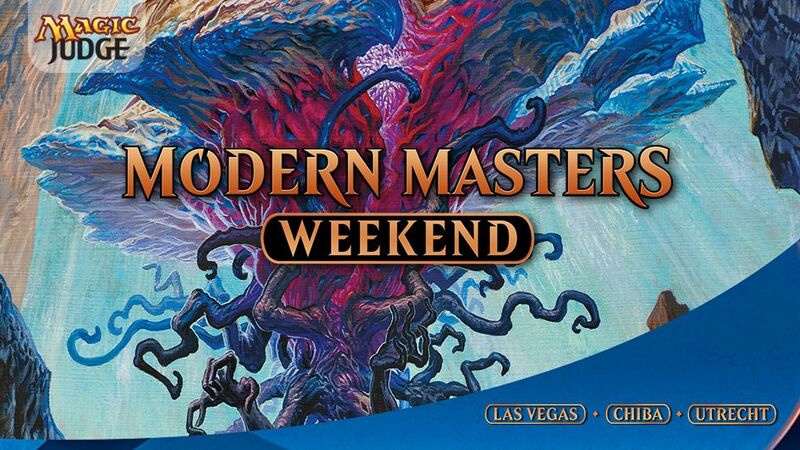 1.- The GP Las Vegas 2015 statistics graphics, with a reach of over 27000 Facebook users (the number of unique users who saw the post on their timelines) this post totaled over 700 direct interactions (likes, comments and shares) and shy of 4800 engaged users clicking on the post to view the graphics. These graphics were produced by the folks at the Graphic Design Gang – special thank you for his outstanding work to Jose Tamargo , L2 from Spain. 2.- The public service announcement recommending caution with May’s WER update, by Australian L3 Fabian Peck , explaining the problem and a workaround to it. This post reached 26000 Facebook users, and was also the one that had the most interactions, with close to 400 direct interactions and over engaged 3000 users clicking on the actual link for Fabian’s article, including those on shares. 3.- The Magic Judge Hall of Fame announcement, by British L3 David Lyford-Smith . 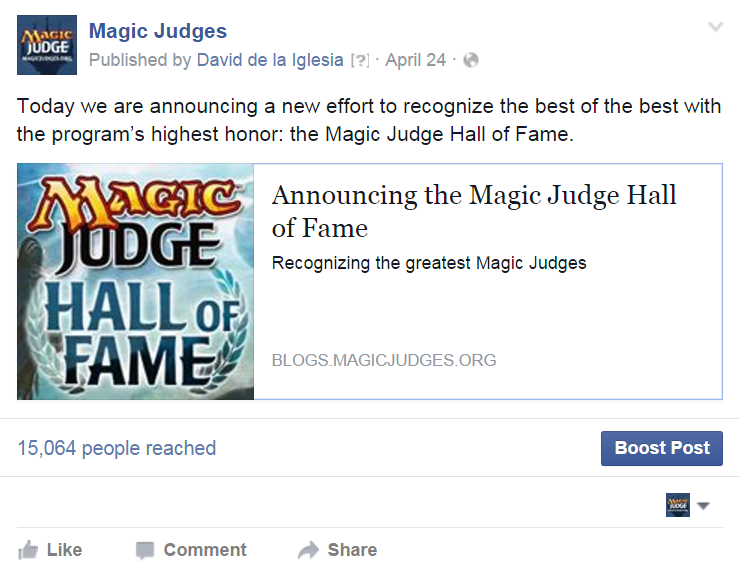 With a reach of 15000 Facebook users this post had slightly over 300 direct interactions and 2800 clicks on the link to the Magic Judge Hall of Fame blog. Worth mentioning is how in previous years the most popular posts used to be those for Grand Prix and Pro Tour staff pictures, but this year the posts for L3 promotions have driven the most traffic to the page. A few examples of these L3 promotion posts are Hans Wang’s, liked by almost 300 people, Jon Goud’s, liked by 340 people,Charlotte Sable’s, liked by 370 people, and Adena Chernosky’s, liked by over 500 people! We will do our best in 2016 to maintain our posting frequency of almost daily updates. We want the Magic Judges Facebook page to be available to promote and advertise your projects and initiatives, please contact us if you want to know more. 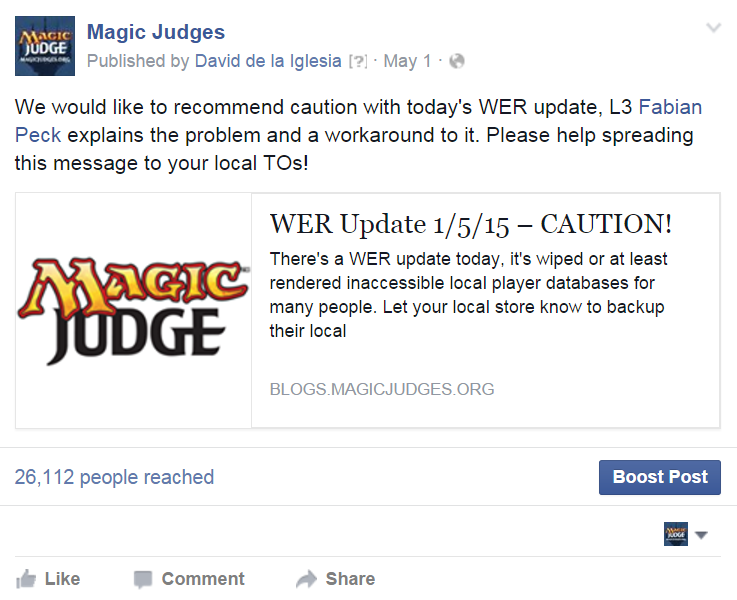 We would like to thank all of those who have requested and/or suggested topics to be posted on the page during 2015, and we hope to be able to help you all better communicating with the judge community during 2016. Finally, a very warm and personal thank you to Jack Doyle for taking care of the project during the last months of 2014 and early 2015.